An aerial view of the stone circle on Birkrigg Common, near Urswick, Ulverston, after bracken clearing. 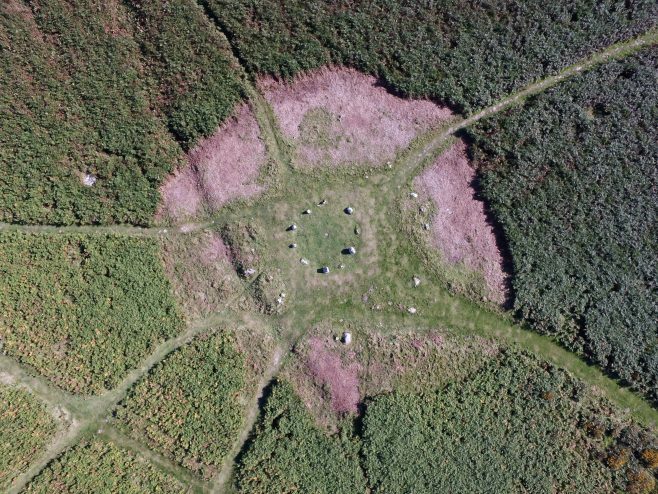 Morecambe Bay Partnership, working in partnership with Historic England and volunteers, through our Headlands to Headspace Scheme, is working to help conserve one of the North West’s most significant but ‘At Risk’ heritage sites – the concentric stone circle on Birkrigg Common, near Ulverston. reconnection of people to their heritage. Birkrigg Stone Circle, a Scheduled Ancient Monument, is on the ‘Heritage at Risk’ register and we want to remove it from that list and ensure that it is better understood and managed, so that more people can learn from and enjoy this wonderful site. What is the importance of this site? Birkrigg Common is a jewel in the Furness landscape, containing a multitude of archaeological sites and important flora, fauna and fungi. It is renowned for its stunning setting, providing panoramic views across Morecambe Bay, the Lake District Fells, the Pennines and beyond. Walkers, cyclists and tourists alike use and appreciate this fabulous resource and this work is helping protect and preserve this unique landscape for future generations to enjoy. Under the supervision of archaeologist, Louise Martin, volunteers are carefully clearing vegetation, primarily bracken, away from the immediate area of the stone circle. This is improving the setting of the monument and revealing the second outer ring of stones, which becomes ‘hidden’ beneath a dense canopy of vegetation during the summer months.